"Solomons, MD - The rich history of where the Chesapeake Bay meets the Patuxent River was showcased Saturday, May 6 at Calvert Marine Museum (CMM). 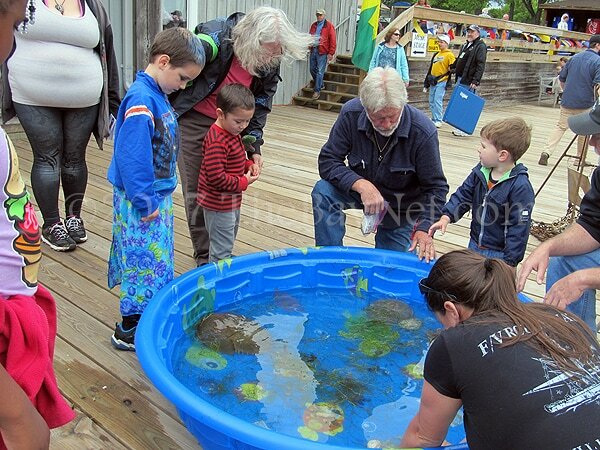 The facility in Solomons hosted its annual Maritime Festival. Although the looming clouds and possibility of rain kept the numbers down, visitors of all ages still took advantage of all there was to see and do." Just in time to be displayed for Discovering Archaeology Month, a rare archaeological find was caught in oyster tongs last month: an entire 300-year-old olive oil jar used for transatlantic trade. On March 25, watermen from Solomons Island Heritage Tours and Patuxent River Seafood found the barnacle-encased jar in the Patuxent River. ﻿"Sometimes ﻿one boat just isn’t enough"
"Dean currently fishes a 40-foot fiberglass and wood deadrise built by John Kinnamon Sr. of Tilghman, Island, Md. The boat works fine, but the distance between Dean’s fisheries prompted him to look for a second boat." "See, in addition to teaching young people — and the mother of two actually teaches professionally: high-school English — Captain Rachel Dean also works on and around the Chesapeake Bay as a waterman." 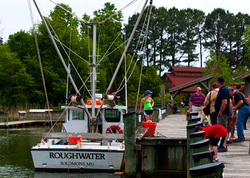 "Photo Essay: Patent Tonging for Oysters on the Patuxent River"
"Dean and his wife, Rachel, are working to change this oft-held perception, using heritage tourism to teach both children and adults about estuarine life and the role that watermen play in the region’s history and economy." "Now considered an endangered Maryland icon, watermen are intertwined with the unique identity of the Chesapeake Bay, influencing its history, culture, and economy. Watermen Heritage Tours offers a rare glimpse into their way of life. 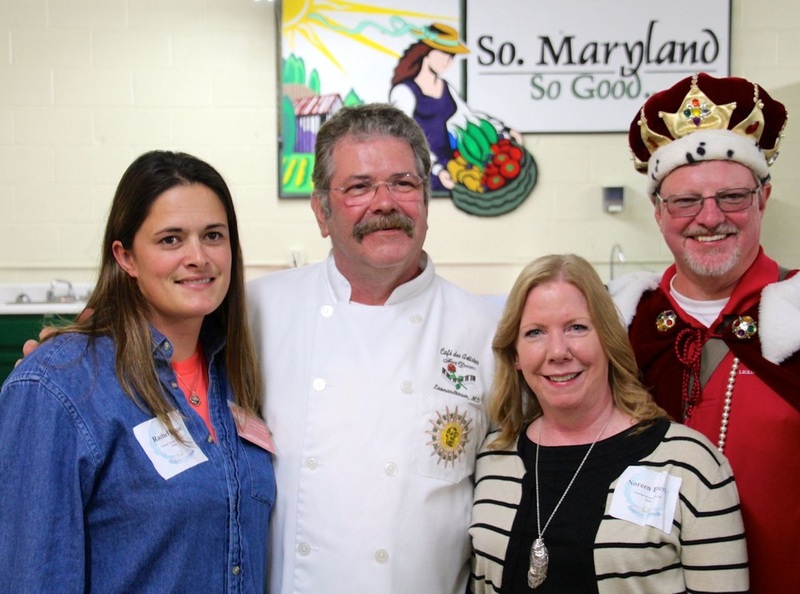 More than entertaining, these authentic experiences are helping to preserve a culture and continue a Chesapeake Bay tradition." "Southern Maryland Watermen Navigating More than the Waters"
she refused a state offer to buy her crabbing licenses." "These Fish Tales Include Props"
"Dean, an English teacher at Patuxent High School, said she had a fiberglass replica of a 42-inch rockfish made because it was the first rockfish caught while she was operating as the charter captain. 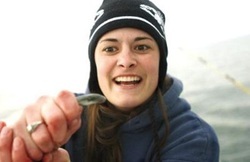 'Nothing feels as good as the first fish … it's what we call ‘getting the skunk out of the boat,' she said." "Join friends, neighbors and patrons of clean water on Maryland’s longest and deepest intrastate waterway for the Annual Patuxent Trash Clean-Up." "Teacher, Waterman Sees her Work as Sacred Trust"
heritage on the water, which is all around them." "If men can do it, so can women"
" 'My mom took me crabbing and fishing when I was a kid,' Dean said. She got her captain's license after college. 'My dad always said I should get a real job, but I can't get away from it. I love it.' "
"Captain Rachel Dean is not a stripper, but there has been some confusion. At seven-months pregnant, Dean walked onto the docks to assist her husband with a bachelor party charter. “Alright! The stripper’s here!” shouted one of the bachelors. “That’s my pregnant wife,” corrected Simon Dean, captain of the Red Osprey, where Rachel is first mate." "Can They Still Make a Living Out There?" 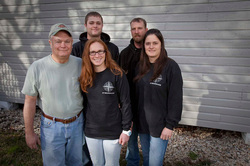 "Dean is a first generation waterman who also owns a wholesale seafood business in Lusby, near the mouth of the Patuxent River. 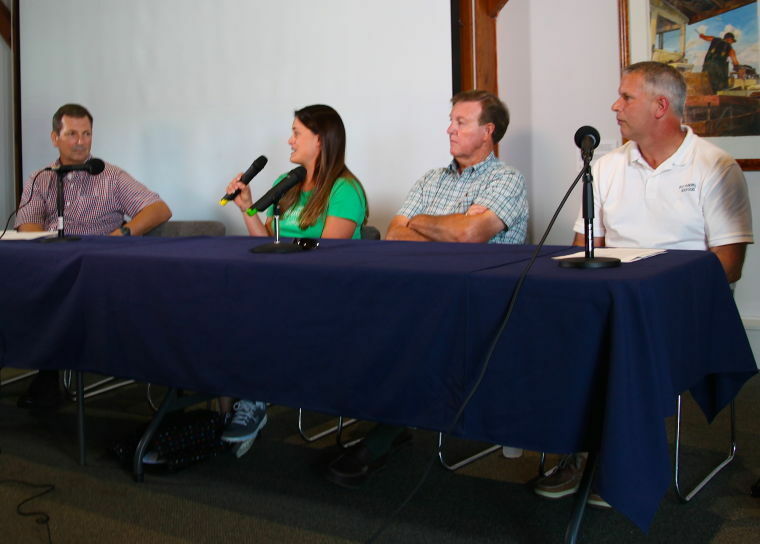 She, along with the other panelists, stressed the importance of educating the public on watermen and the local seafood industry. She gives heritage tours and helps the watermen’s association facilitate programs like Waterman’s Appreciation Day at the maritime museum." 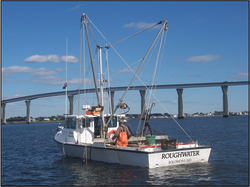 "Time to start reeling them in"
"Chesapeake Workboat Roughwater – Be a Waterman for a day and take a one hour excursion aboard the Roughwater, a Chesapeake Workboat with Captain Rachel Dean. "